This military camp was called ‘Barakkenkamp Appelweg’ and consisted of six hutments, built in a square. The site of Barakkenkamp Appelweg was partly forested. It was accessible via the Kapelweg and the Laan 1914. At this crossing, at the beginning of the Appelweg, a barrier was built on the ground of Amersfoort. The gate, made of bricks, and the remainder of the camp were situated a bit further on, on the ground of Leusden. 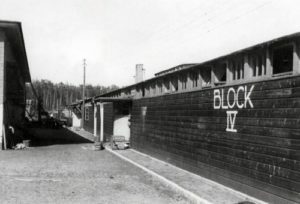 Messrs. Hertzinger and Schimmel were the building contractors in charge of the erection of the huts and the Salomons company made the concrete foundations. Two huts were in use for the administration, a kitchen and a canteen. 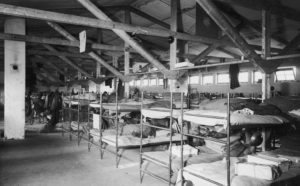 Four more huts served as quarters for young NCO’s and enlisted men. The officers and older NCO’s were accomodated in houses in Amersfoort. Next to the site at the Appelweg, at the corner of the Leusderweg and the Laan 1914, the Barakkenkamp Amsvorde was built to house two companies. This site was owned by the municipality of Amersfoort. The Ministry of Defence paid the owners the rent for both sites. The huts at the Appelweg were meant to house the soldiers that trained on the Leusderhei (training ground) and were also busy building the Grebbelinie (defence line) and the defence line around Amersfoort. Some trenches built for training were discovered around Kamp Amersfoort. During the mobilisation of 1939 – 1940 the 1st Batallion of the 16th Regiment Infantry was housed here, about 650 man in total. The commanding officer of the regiment was wing commander J. Visser, the officer in command of the batallion was reserve captain Jacob Klaverstijn. When the Germans attacked the Regiment was deployed in the surroundings of Hamersveld. After a few days of battle it was withdrawn behind the Hollandse Waterlinie (water defence line). Just like in the First World War the policy of The Netherlands was based on trying to remain neutral. In the thirties the government actually tried to prevent another war. Still, a war was considered possible. The threat coming from Germany in the years between 1930 and 1940 lead to the Dutch government spending more money in order to strenghten its defence lines. One of these was the Grebbelinie, running from the Grebbeberg, near the river Rhine to the IJsselmeer via Amersfoort.